If you're looking for the most powerful PC available, you can stop searching. Meet the new Origin Millennium. Intel’s recently released octo-core powerhouse, the Core i7-5960X, is the first exciting processor from the company since the first 3960X six-core chip dropped back in 2011. Finally, after several years of waiting, enthusiasts can buy a chip that provides more than a mild upgrade, and dominates everything that came before it. 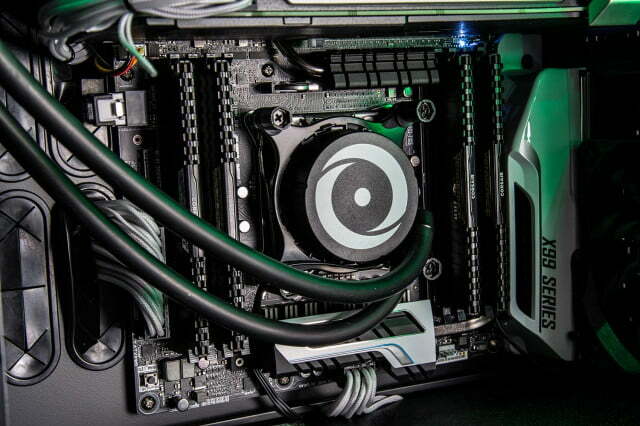 Yet the 5960X’s base performance, strong though it may be, is just the tip of the iceberg. The processor is fully unlocked and can be overclocked to even greater heights. Origin has taken advantage of that fact in its new Millennium desktop, which liquid-cools the processor and overclocks it to 4.5 GHz. That’s 1.5 GHz higher than the stock model’s base clock. Origin didn’t stop there. 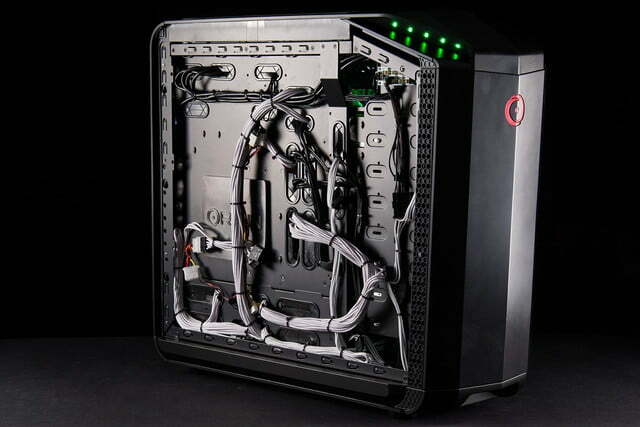 They’ve paired the processor with three Nvidia GeForce GTX 980 video cards, 16GB of DDR4 RAM, and an ASUS X99-Deluxe motherboard. Perhaps most impressive of all, however, is the price. Despite its upgraded internals, this new model retails for $6,300. That’s about $600 less than the Millennium we reviewed earlier this year. Is there a catch? Or is the new Origin Millennium simply a bigger powerhouse with more value than before? Origin calls the Millennium a mid-tower, but its size is equivalent to some systems that are advertised as full towers. We measured it at (rounded to the nearest inch) 21 × 10 × 22 inches. It also weighs in at over 50 pounds. Design students should take note. If it’s not a handle, don’t make it look like one. 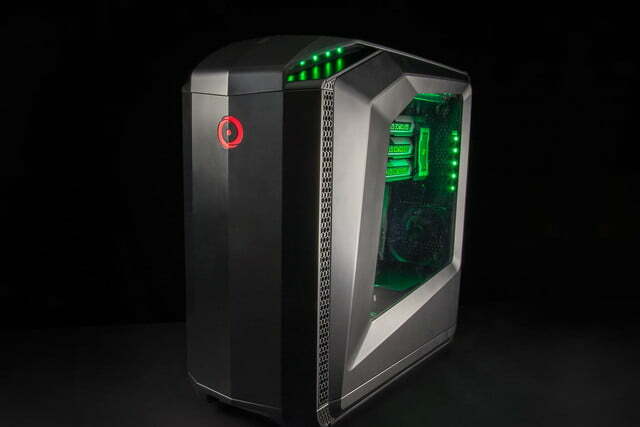 The enclosure consists of a custom design that Origin debuted at CES 2014. A large side panel window, and a complex, remote-controlled LED lighting system puts the tower’s enthusiast chops on full display. It boasts a stealthy, unassuming look. Turn the LEDs on, and it’s Superman. Turn them off, and it’s Clark Kent. Metal and plastic are used in the Millennium’s chassis. The former feels premium and sturdy, but the latter is a let down. A few build quality issues can be found along the top panel, where plastic is used to form a series of scoops and dips that enhance the rig’s visual appeal. They look like handles, but they’re actually flimsy. The system even ships with big red labels warning users that these are “NOT A LIFT POINT.” Design students should take note. If it’s not a handle, don’t make it look like one. The top of the system also offers excellent connectivity. Here, we found four USB 3.0 ports, and individual headphone/microphone jacks. Fan control knobs, and the usual power and reset buttons are present too. Many competitors have just two forward-facing USB ports that may or may not support USB 3.0 speeds. 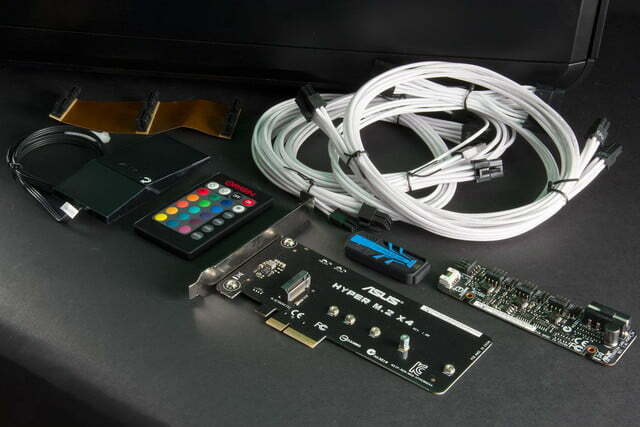 Around back, there’s an incredible array of ports, including 10 additional USB 3.0 connectors, two USB 2.0, two Ethernet jacks, 5.1 audio, and antenna connections for the motherboard’s built-in Wi-Fi, and Bluetooth. 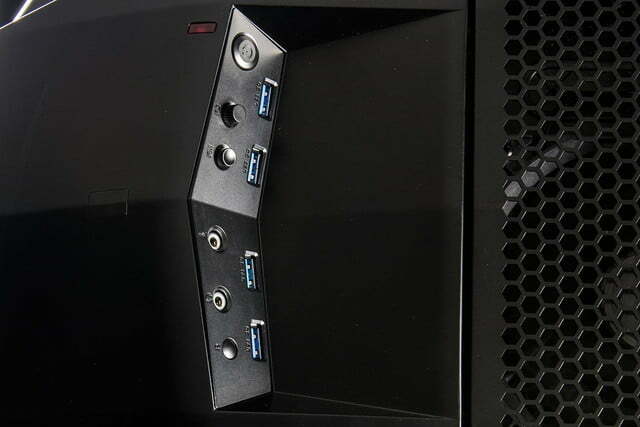 The three GTX 980s each provide three DisplayPort, one HDMI 2.0, and one DVI. Note, though, that not every video output can be used simultaneously. Nvidia’s drivers currently support up to four monitors at 4K. That cap does not increase when extra cards are installed. The unique selling point of Origin’s custom case is not looks, but high levels of customization instead. 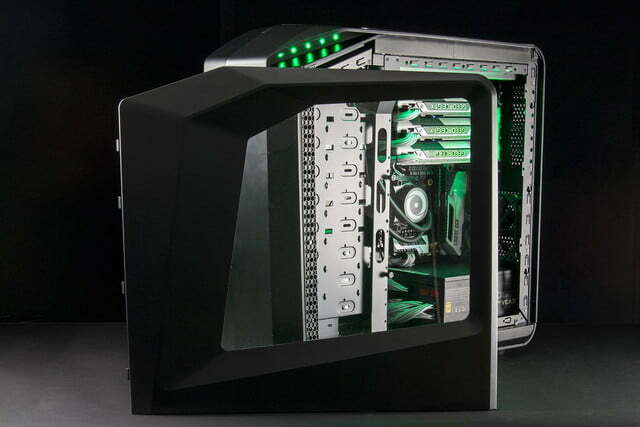 Every Millennium mid-tower and Genesis full-tower can be configured so that the case opens from the left or the right, depending on the user’s preference. 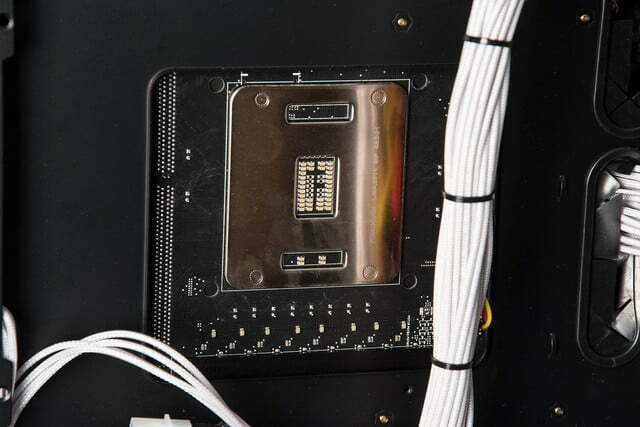 Origin can also build the system so that the motherboard’s ports face the rear, or the top. Your Millennium will be built to fit your precise desires. The new Millennium throws our previous records in an industrial shredder and burns the leftovers. In theory, this means the system can later be re-configured if your needs change. In practice, that’s too difficult for most users to attempt. Changing the internal layout means re-routing Origin’s carefully positioned internal wiring, moving fans, and removing the entire motherboard. We think enthusiasts who are willing to go that far should just build their own rigs at home, instead of buying them from a manufacturer. Don’t let this turn you off, however. The Millennium is a big computer, no matter how you have it built. There is no shortage of room for upgrades. Opening the case door is as simple as pulling a lever. Once removed, users have quick access to everything inside the system. Anyone with a passing familiarity of PC hardware, and a screwdriver, can replace the video card, RAM, or hard drives within 10 minutes. The old Origin Millennium, which we reviewed earlier this year, still holds most of our desktop PC testing records. Its overclocked six-core processor was about as powerful as the stock 5960X, so we were eager to see what Origin could do with two extra CPU cores. The results will astound you. Look at that graph. 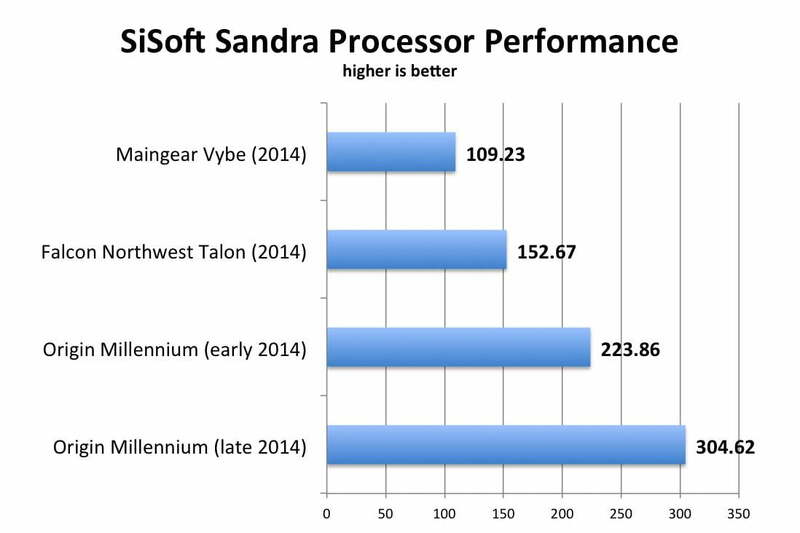 In SiSoft Sandra’s Processor Arithmetic benchmark, the new Millennium’s overclocked 5960X hits a score of 304.62 GOPs. That beats the older Millennium’s score of 223.86 GOPs by over 80 points. The new Millennium doesn’t just break our previous records. It throws them in an industrial shredder, and burns the leftovers. 7-Zip’s compression benchmark told the same story. The new Millennium hit a combined score of 50,754. That easily beats the stock 5960X’s score of 39,431, and the old Millennium’s score of 38,704. The Falcon Northwest Talon and the Maingear Vybe, both of which had Intel quads inside, scored 27,615 and 19,902, respectively. Those systems are not slow. It’s just that the overclocked 5960X is clearly in another league. Geekbench had more good things to say. The Millennium hit a single-core score of 4,173, and a multi-score grade of 30,637. This easily beats the stock 5960X’s scores of 3,308, and 23,216. The most notable difference here is the single core result. A stock 5960X is slower than a stock Core i7-4770K, which scores 3,587, but the Millennium’s overclocked chip easily defeats that result. Obviously, the processor is fiendishly powerful, but what about the hard drives? They also perform well. The Samsung EVO 1TB solid state drive delivered a read speed of 442.2 megabytes per second, with random access times of under one millisecond. 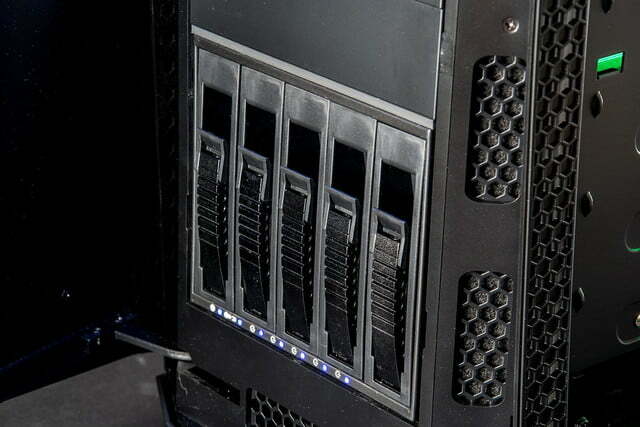 Our review unit also packed a 3TB mechanical drive which, to our surprise, hit read speeds of 170MBps. Access times were around 16 milliseconds, however, so the drive is best used for storing large files that aren’t frequently accessed. 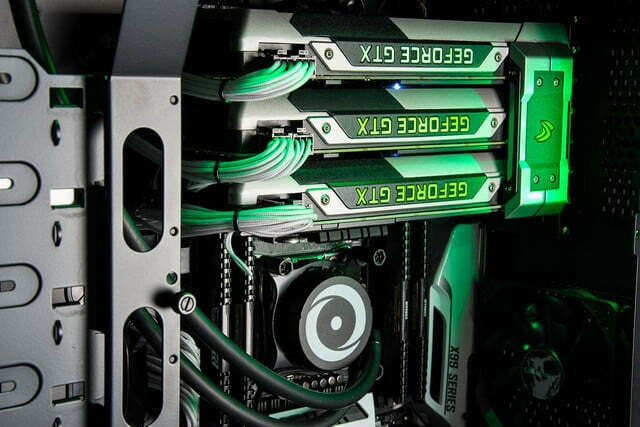 The overclocked processor is joined by a trio of overclocked Nvidia GeForce GTX 980s in triple-SLI mode. This arrangement hit a 3DMark Cloud Gate score of 53,757, and a Fire Strike score of 19,714. That beats the previous high Fire Strike score of 15,154, which was reached by an Origin Chronos with a GTX Titan Z video card earlier this year. It also smashes the score reached by the early 2014 version of the Millennium. Note, though, that performance isn’t scaling in a linear fashion. The Falcon Northwest Talon is half as powerful in this test, despite the fact that we reviewed it with a single GTX 780 Ti video card inside. 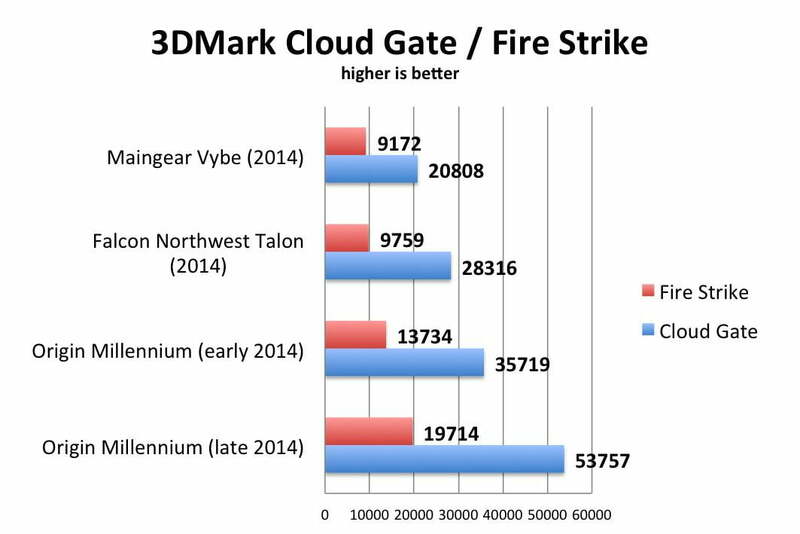 A synthetic benchmark like 3DMark does not tell the full story, however. Let’s see how the Millennium does in real gaming situations at 1440p. This strategy game is known to put a lot of strain on a computer’s processor, as well as its video card. Yet, it proved to be no trouble for the new Millennium. We recorded an average frame rate of 97 frames per second at Medium detail, with a maximum of 116, and a minimum of 67. Turning detail up to Extreme lowered the average to a still-strong 69 FPS, with a maximum of 101, and a minimum of 58. These results are the best we’ve recorded. This is also first rig we’ve reviewed to average more than 60 FPS at Extreme detail, and 1440p resolution. Most desktops won’t average 60 FPS, even at 1080p. While the Rome II results were good, the figures produced in Battlefield 4 were astounding. Medium detail was no challenge at all. The Millennium ran at the game’s cap of 200 FPS throughout most of the test run. Turning detail up to Ultra lowered the average just slightly to 178 FPS, with a maximum of 200 (the cap), and a minimum of 120. The next most powerful system we’ve ever tested, Origin’s Chronos, hit 150 FPS at just 1080p. 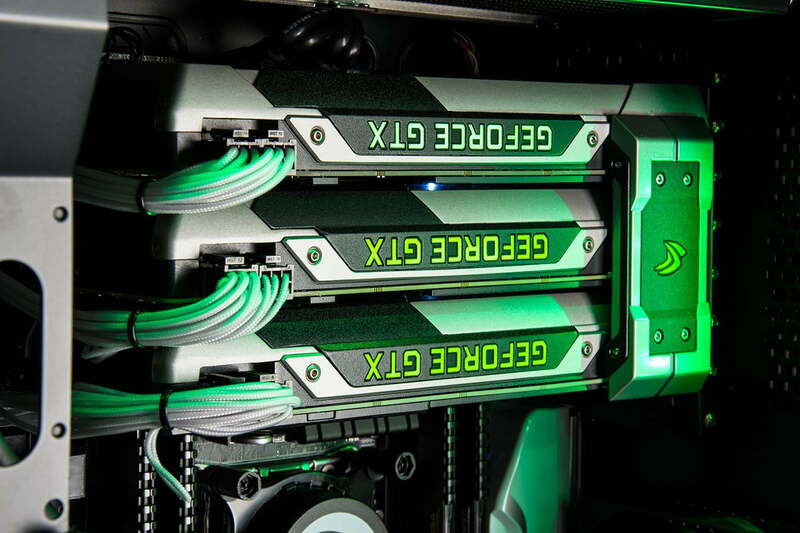 Nvidia’s overclocked GTX 980s are showing their worth in this game. The world’s most popular PC game is also the least demanding title in our test suite, and the Millennium gobbles it up without hesitation. At Medium detail, League of Legends ran at an average of 416 FPS, with a maximum of 521, and a minimum of 310. Turning detail up to Very High produced an average of 282 FPS, with a maximum of 366, and a minimum of 194. These are also the best scores we’ve ever recorded. The Millennium beats the next most powerful system, the Falcon Northwest Talon with a GTX 980 installed, by almost 100 FPS. We’ve yet to include 4K testing in our standard test suite for gaming desktops, so we don’t have comparative results to share. We did try gaming at 4K with the Millennium, however, and found the experience to be shockingly smooth. Battlefield 4, when set to 3,840 x 2,160, ran at 74 FPS with details set to Ultra. Total War: Rome II ran at just under 60 FPS. League of Legends rendered at close to 200 FPS. 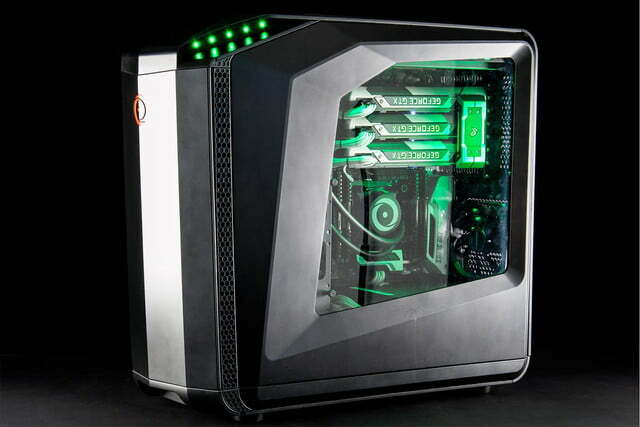 Origin’s desktop is capable of 4K gaming. That’s no small feat. Even the AMD Radeon R9 295X2 video card, a liquid-cooled, dual-GPU monster that we tested earlier this year, could not hit 60 FPS in Battlefield 4 at 3,840 x 2,160 with details set to Ultra. Gamers who seek smooth gameplay at the highest possible settings need to give the new Origin Millennium a serious look. 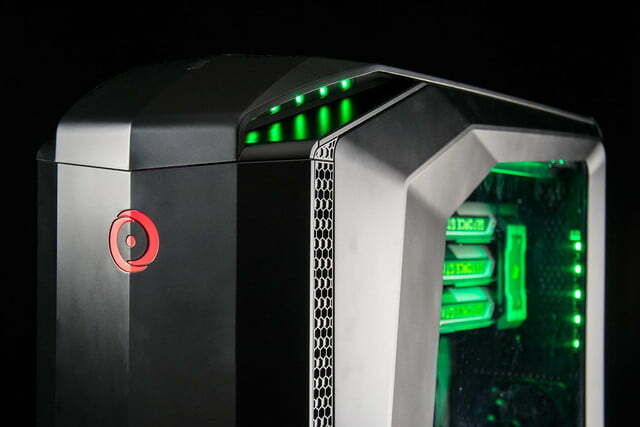 Origin’s Millennium is easily the most powerful desktop we’ve ever reviewed. 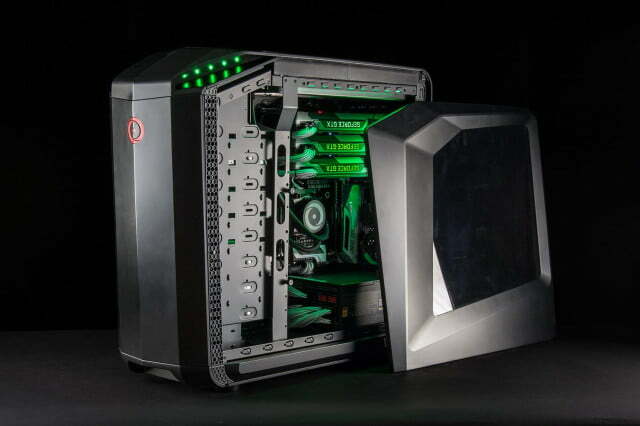 It demolishes everything that has come before it in both benchmarks, and real-world gaming. 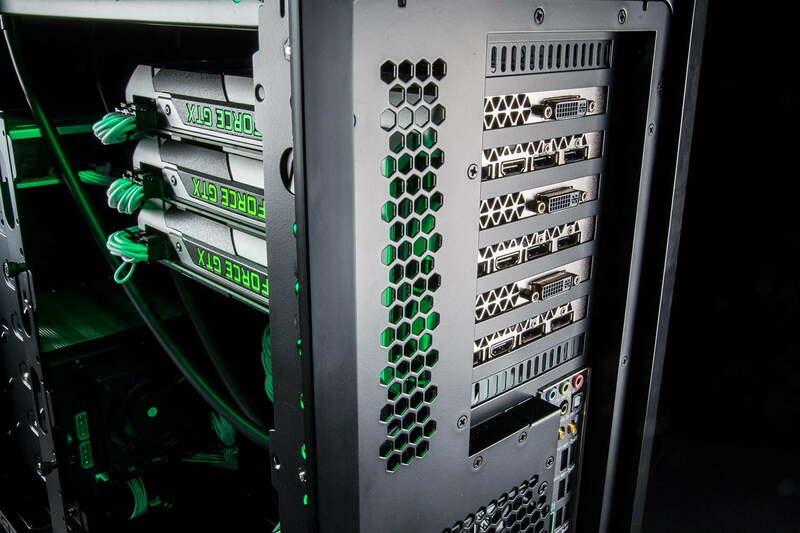 There is always a price to pay for absurdly powerful hardware, however, and we’re not just talking about the price tag. Noise is a demon that computers like these can’t outrun. It boasts a stealthy, unassuming look. Turn the LEDs on, and it’s Superman. Turn them off, and it’s Clark Kent. At idle, the Millennium emits a loud, but not unbearable 44.2 decibels. That’s more than the Falcon Northwest Talon, which puts out 41.2dB at most under load, but the Millennium is at least tolerable here. 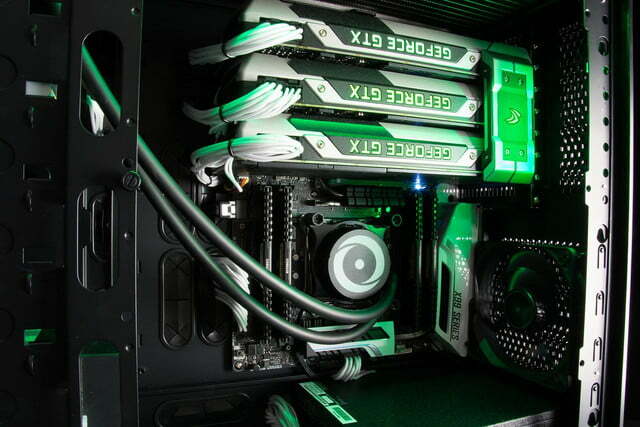 Play a game, though, and Origin’s rig roars to life. On average, it puts out at least 49dB. On occasion, the fans will ramp up into their most aggressive mode, which puts out a room-filling howl to the tune of 60dB. A manual fan control knob is included, but it does little to manage noise at full load. Then there’s the heat that this thing puts out. Running the Millennium through our benchmarks, which is a process that takes about two hours, increased the ambient temperature of a 250 square foot office from 69 degrees Fahrenheit, to 75 degrees. There was no heater, and no other computers were turned on aside from a MacBook Air. There was no significant change in outside temperature, either. 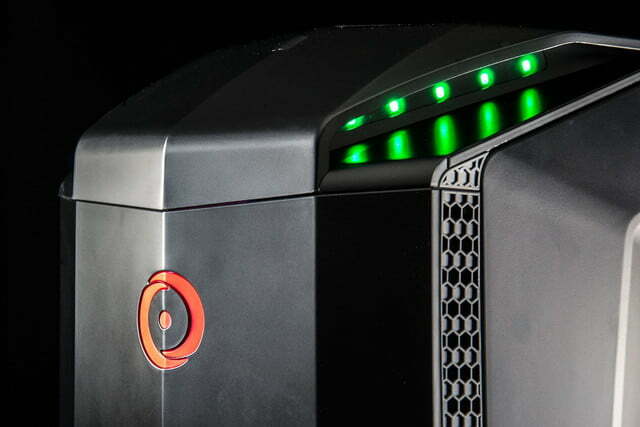 Origin has accidentally created the world’s most expensive portable furnace. This heat is the result of extreme power draw, though in this area, the Millennium did better than expected. We recorded 293 watts of consumption at idle, and 684 watts at full system load. That’s almost double the Falcon Northwest Talon, which drew 349 watts at load, but the Millennium is twice as faster. 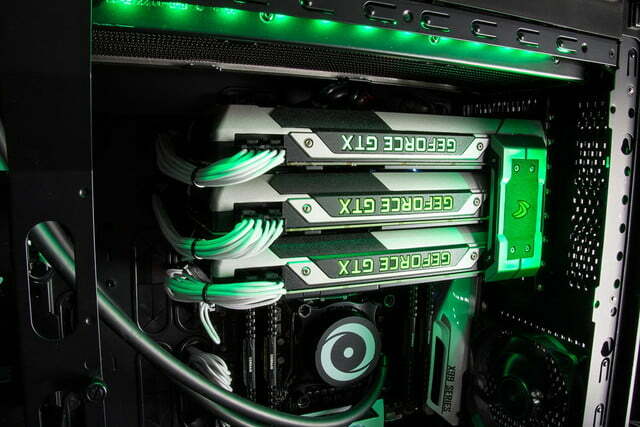 This rig is efficient for an overclocked, tri-SLI tower. The Millennium comes with a one-year warranty, and 45 days of free shipping if service is needed. This can be extended to a three-year warranty with free shipping for the same duration at a cost of $269. Lifetime free labor, and 24/7 support is available with all of Origin’s warranties. Origin’s service is solid, but its default warranty duration is behind the pack. Most competitors, like Falcon Northwest, and Digital Storm, offer a default three-year warranty. They’re more expensive though, so it all evens out in the end. The Millennium’s performance speaks for itself. Origin’s desktop completely destroyed almost every record we have to break. 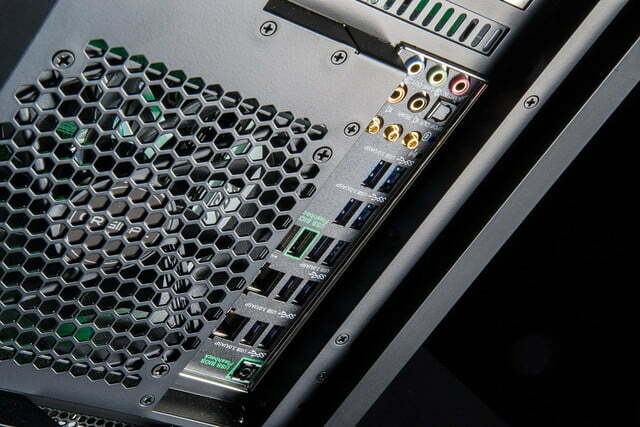 Readers looking for the most powerful PC available can stop searching. The new Origin Millennium is it. 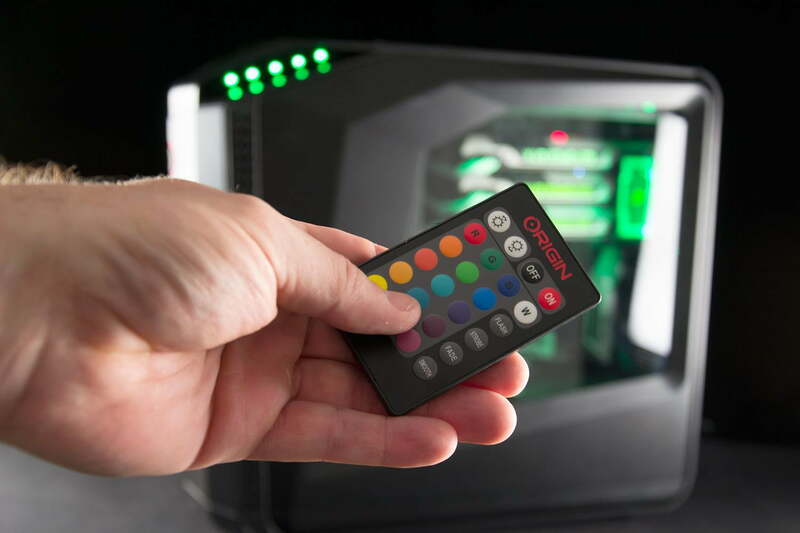 That alone would be enough to earn high marks, but Origin was not satisfied with delivering a PC that just wields obscenely high performance. The company also offers strong value as well. Our review unit rings up at $6,300, and while that’s no small chunk of change, it’s several hundred less than the previous Millennium. A roughly similar Mach V from Falcon Northwest is about $300 more, and a similar Aventum II from Digital Storm is over $7,000. We found just one problem with the Millennium. That issue is noise, and lots of it. 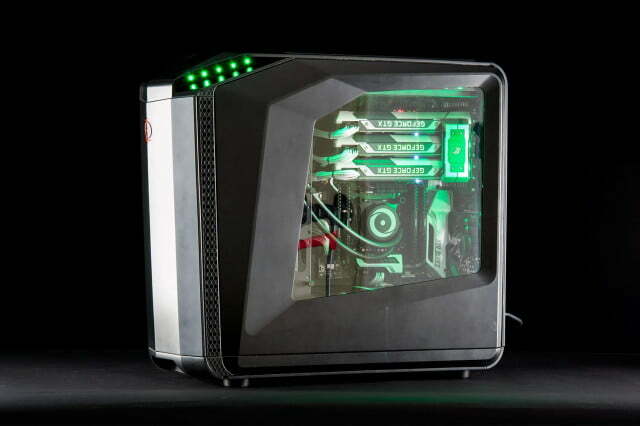 Buyers who are thinking of getting this desktop should give serious thought to the environment this rig will be used in. Gamers who play with headphones on won’t mind the volume, but those who use speakers in a quiet room will find the fans to be distracting. Still, we applaud what Origin has delivered. 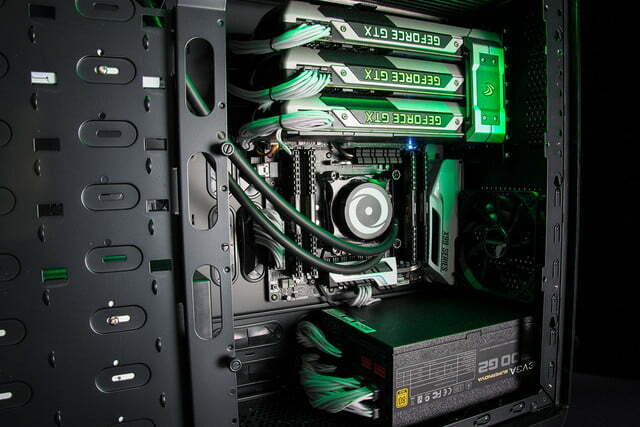 The Millennium uses aggressive overclocking and new graphics cards to deliver cutting edge PC performance. Yet, it’s less expensive than the last model, and most competitors as well. Performance and value are always a winning pair.